I haven’t thought that I could finish one without my Mama guiding me, but I did! It felt good and wherever my Mom is, she’ll be proud of me. This is the very first skirt I was able to cut and sew. Glad to say that I made it! It was a perfect fit to my daughter, Keanna. She wore it at Jillian Ward’s (aka Trudis Liit) birthday party and wore it again as her “costume” in their school’s declamation contest where she was a 2nd placer. I chose this color for Keanna because purple is her other fave color. Of course, most girls love Pink, right? you did a great job sewing this pretty skirt for your daughter…it looks good on her; she's pretty in purple! You're so good with things, first try pa lang yet you made a very elegant piece! Congratulations again ate K! Proud tita ako ehehe! She look nice on purple,no wonder,it her favorite! great work! I love to sew also but it's been a while since I got myself work on my grandma's sewing machine. How I wish I know to sew. It would be nice and we could save more if I know how. Congratulations, Mommy! You've made a very lovely purple skirt for your daughter. I bet that's her lucky charm, too, in that declamation contest. Happy MM! wow, you made the skirt yourself! keanna is sure lucky to have a very skillful mom. i can't even mend my toddlers' clothes. here's my entry http://www.totteringmama.com/2011/03/mommy-moments-purple-less.html it's not about the toddlers though. So cute and lovely in purple! Purple Galore at my page, have a good weekend! you did a good job sewing your daughter's skirt mommy stef..
Wow! 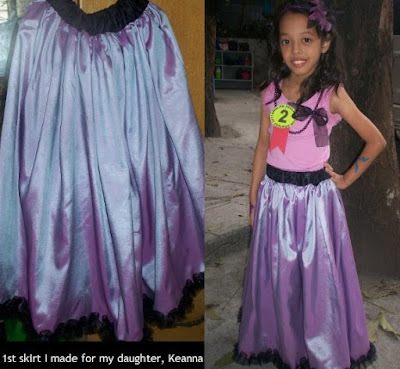 ang galing mo naman mommy stef for being able to make your daughter's skirt! Bravo! 😀 what an achievement! 😀 thanks for sharing this joyous moment with us at mommy moments! Wow, galeng! I wish I learned from my mom who can sew but I didn't. Kaya heto ni magtagpi ng butas na nyorts di ko kaya, ahaha. Lovely daughter you have there! Happy weekend! she's lovely as always more with that beautiful skirt, well done mommy! wish i could learn how to sew too! PinayMum – Mommy's Life Around…doing her round for late visit and wishing you a great week!